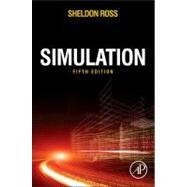 Ross's Simulation, Fifth Edition introduces aspiring and practicing actuaries, engineers, computer scientists and others to the practical aspects of constructing computerized simulation studies to analyze and interpret real phenomena. Readers learn to apply results of these analyses to problems in a wide variety of fields to obtain effective, accurate solutions and make predictions about future outcomes. This text explains how a computer can be used to generate random numbers, and how to use these random numbers to generate the behavior of a stochastic model over time. It presents the statistics needed to analyze simulated data as well as that needed for validating the simulation model.